Hopp Schwiiz! Hey all, great match from Roger today which was what I expected after struggling just a little in the first round against Falla. Today was a totally different story and Roger came up with the goods breezing through 6-2 6-2, a peRFect prediction by yours truly. The only real sniff that Benneteau got today was in Rogers opening service game, where two errors saw Roger slip to 0-30 and then the Frenchman made deuce. After that it was plain sailing, Roger broke easily in the next game and was able to cruise through the first set, breaking again at 5-2 to take the set 6-2. After Roger held his opening service game from 0-30 you kinda just knew he was going to have a good day at the office, his serve was finding spots early and unlike when he met Benneteau at Wimbledon it was Fed who dominated the rallies and early exchanges. Roger was also very solid on serve, dropping only 5 points on it after the deuce of the first game. Securing a double break to take the first set worked out peRFectly here because it meant Roger was serving first at the start of the second. Roger is one of the best, if not the best, front runners in the game. With Benneteau down a set and having to keep serving to level up proceedings it meant there was far more pressure on his own serve (that he'd already lost twice in the first set). At 2-1 Roger moved up a gear and broke again before holding and then breaking yet again at 5-2 to take the match. Roger only conceeded 5 points on serve again and hit 24 winners to 7 unforced errors throughout the match, very decent stats. 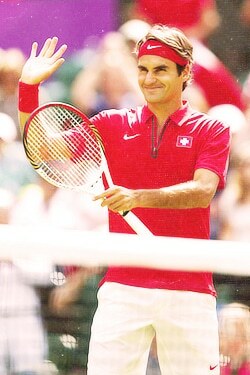 Today was a very impressive performance from Fed and really you have to call it a clinic. I figured it would be after the 5 setter at Wimbledon because it's pretty rare that Roger struggles against a player twice on the bounce. There was also a mental advantage from Fed's side of the net because he really took Benneteau's legs away at Wimbledon and outlasted him despite at one stage been 1 game away from losing. Today I was particularly impressed with Roger's movement, he was able to hit the inside out forehand very well all day and this coupled with precision serving was probably the key to the match. At Wimbledon against Benneteau he didn't hit that shot well early on, but when it's on, like today, the majority of points are played on Roger's terms. When he is able to dictate with his forehand, he only really has to play half the court, whereas Benneteau has to cover all of it. It's almost impossible for Benneteau to hit a backhand down the line because it's such a low percentage shot, if he falls short or doesn't get close to the line, he leaves the cross court wide open for Roger to find a winner. Because of that he's forced to hit cross court, where Roger runs round his backhand and eventually pushes his opponent deeper behind the baseline, allowing him to either a.) draw the error, b.) coast in and find a volley winner, c.) try the dropper, d.) hit inside in down the line or e.) hit an extreme angle inside out forehand winner. It's really such a dominating play that gives Roger many many options and as you can see from the scoreline it's very tricky to find an answer to or combat it with any great deal of effectiveness. You have to be a left handed moonballer or hope Rogers forehand is AWOL, both of which are rare! To be honest I've not seen a whole lot of Istomin before, he's only ever played Fed twice (losing both times) and doesn't have a great record on the tour with no titles but he did reach his career high ranking of #34 this year. I do however think he's a fairly accomplished grass court player, Wimbledon is his best result at Slam level and he took Berdych to 5 sets on the grass in 2010. He made the 4th round this year and would have played Roger in the quarter finals had he not lost to Mikhail Youzhny. I think this match might be trickier than the Benneteau one but I think Roger will get the job done. I kinda think he could drop a set but that's a slim chance to I'll go for a 7-6 6-4 victory. The solid win that Fed needed after the Falla match. I think he’ll swiftly take out Istomin. Yeah cruising today was always gonna happen after Falla match, will have got confidence from that for sure. I’ve not seen much of Istomin, clearly capable though so could be close in parts. He’s a good player, but I think on grass, it will be a lot like how Federer plays Roddick – block back the big serve and outmaneuver him from the back of the court. Doesn’t like has too much power from the highlights I’ve seen. If Fed serves well then 1 break per set will be enough. If they get to the final I might blog about it, but I don’t have a big interest in doubles really… it’s just like a light practise session I always find. Haha I wonder what odds it would have been! I remember almost having a heart attack when I was following live scores on my mobile. I had to manually refresh the page to see the updated scores and when the score was 30-30 on Roger’s service game (to stay in the match), I did not want to press the refresh button in the possibility of seeing match point for Benneteau! Roger likes to torture his fans, fact! Does that include the breaker? I remember 15-30 at 5-6 I think, and I think 30-30 at 4-5. I want Roger to win and I think he will, but Olympics isn’t a big deal to me and to be honest I don’t think it’s huge for the players. It’s just a nice tournament to win. Isner could be a bigger problem in the QF. Thoughts? Not sure really, he’s just a serve. We saw today when Clownga beat Raonbitch that you need more than just a serve. If Fed hits forehand well and is aggresive on Isner 2nd serve should see him off. Yes it was a peRFect prediction. I have not been able to see any of his games at the Olympics. I was traveling on Saturday and got up at 5:45 am on Monday and Roddick was playing his match.i was expecting Fed to play. So not knowing the exact time between 7-3 EDT is hard and there are no repeats on The Tennis Channel. They should be allowed to do that. I do hope he plays early tomorrow so I can see at least one game. Heyy!!! It’s been a while since you posted! I think that Federer will go past Istomin with ease, but the next match will be slightly tougher, because Roger’s opponent will either be Tipsarevic or Isner. Mississippi. I did see it today on Bravo. I watched the first part until it started raining. Thanks though. I think it was around 8:00 CDT. I hope that he will play earlier tomorrow. I hope he starts off better tomorrow if not Isner will pull another Swiss game. He has got to get the Gold now. Ah right cool. He started late today so I guess you missed it. He’s first on tomorrow though 12 GMT against Del Po so hope you can watch.